The recession changed a lot of things. It changed the way people spend money, the way they save for retirement, the way theyA investA in stocks. It’s also changed the way companies recruit employees. Gone are the days when companies courted prospective employees, hiring managers offered generous starting bonuses and job seekers could choose from multiple offers. According to The National Bureau of Economic Research,A the recession ended in 2009. Since then,A companies have been slowly emerging from survival mode and have begun more active hiring. Yet the job market has been forever changed, and job seekers have had to face a new reality. So how does a job seeker succeed in the current job market? Here are six ways the job search has changed and the adapted tactics that can help in the job hunt. Before the recession, it wasn’t uncommon for a skilled, qualified job seeker to be romanced by a prospective employer.A RecruitersA would seek out candidates without the candidates having to do much in the way of aggressive follow-up. That’s rarely the case anymore. These days, job seekers need to act in order to find jobs and get the attention of employers. This means job seekers must be active in their job search and set ‘alerts’ on major job boards/search engines so they are notified when an appropriate job match is posted. This also means that job seekers should utilize several job-search strategies, such as job boards, job-search engines, classifieds, networking sites and social media, in addition to job fairs and hiring events. In the early 2000s, jobs were more plentiful, and if you didn’t get one job, chances are there’d be another one just like it. Yet nowadays, the odds are not in a job seeker’s favor. According to the Bureau of Labor Statistics, when the recession began in December 2007, the number of unemployed people per job opening was 1.8. In June 2009, there were 6.1 unemployed people per job opening. While the number has since been trending downward and was at 4.2 as of November, you still need to find ways to stand out from the competition. Back in the “glory days” before the recession, mistakes made in application materials or during an interview weren’t ideal, but they weren’t necessarily automatic deal breakers, either. If a candidate misspelled a word on his rÃ©sumÃ© but otherwise had all the right qualifications, the employer might have let the error slide. In this job market, there’s no room for errors. “Nothing less is accepted or tolerated in a market where there are many more candidates than positions, and companies need to be sold on adding head count,” Cohen says. To avoid making costly mistakes, proofread your rÃ©sumÃ© backward and forward, and then have someone else proof it again. Ensure you’re fully prepared for an interview by researching the company and practicing answering interview questions. Before the recession, human-resources teams were more robust and better equipped to manage the hiring process. During the recession many companies downsized, leaving HR short-staffed and buried under piles of rÃ©sumÃ©s. Recruiters have had to finds ways to recruit more efficiently, and social media have become a solution for hiring managers to find and screen candidates more quickly. That means job seekers need to have a social media presence, and a professional one at that. It is no longer acceptable in this job market to use a “spray and pray” method of applying for jobs. Blanket emailing recruiters with the same rÃ©sumÃ© willA increaseA the chances that yourA application gets tossed to the side. Newell says it’s important that job seekers create targeted rÃ©sumÃ©s. “They must have a different rÃ©sumÃ© for each job they are applying for, and they must ensure that they effectively communicate their skills which relate to the job [for which] they are applying.” The same goes for cover letters. The job market may not look the same as it did five years ago, but that doesn’t mean you have to start from square one. It just means that by equipping yourself with the job-search tools needed in today’s world, you’ll be in a better position to get hired. 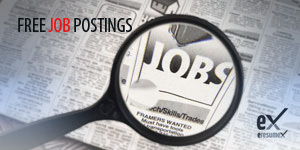 As always, you can count on EresumeX free job search portal.